Church Leadership Development International (CLDI), is a registered 501(c)3 non-profit organization. 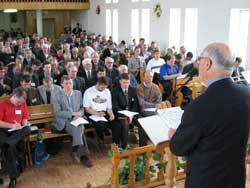 CLDI provides non-formal continuing education to pastoral leaders in Eurasia. * Teachers at CLDI training events have included Dr. Howard Hendricks, Bill Hull, Dr. Walt Kaiser, Dr. Ramesh Richard, Dr. Aubrey Malphurs, Dr. Robert Coleman, Dr. Ajith Fernando, Dr. Chris Wright, Dr. Joel Comiskey, Dr. Roman Dechtirenko, Dr. Nickolay Revtov, Dr. Sukhwant Bhatia, Rev. Celestin Muskura, Rev. Charles Cooper, Rev. Gary DeSalvo, Rev. John Worcester, Dr. Timothy Warner, Dr. David Den Hartog, Rev. Richard Howell, Rev. Howard Hugo, Dr. Phil Howard, Dr. Don McMinn, Dr. Roger Yancey.